With a year's worth of wondering whether the resurgence was real, Tiger fittingly capped the end of the season with his answer. ATLANTA — They couldn’t wait. Not for a fist pump, not for a final putt, not even for the ball to land on the green. Tiger Woods was walking down the 18th fairway as the leader on this final day of the Tour Championship, striding and smiling side-by-side with playing partner Rory McIlroy, and without any invitation besides their own joy, dozens and then hundreds of fans began thundering behind the pair in an impromptu parade that verged on stampede. They whooped; they cried out “Tiger!”; they held their cell phones aloft to capture themselves as hapless event staffers failed to do the same. By the time Woods was on the green, needing only a three-putt for victory, the throng punched the air and chanted his name, resembling less a golf crowd than a stadium of concert-goers demanding an encore. 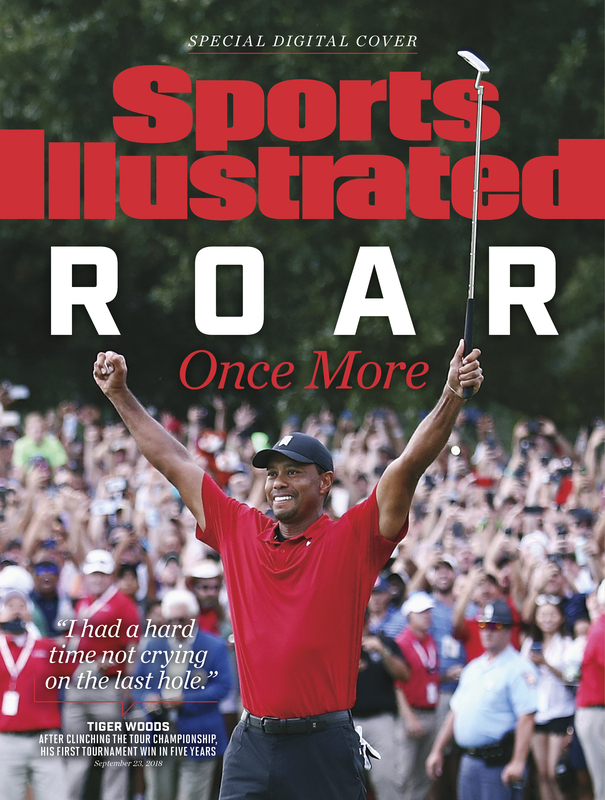 When Woods tapped home his 71st and final stroke of the day he did not unleash the balled-fist uppercut of old but instead bent calmly to retrieve his ball amid yet another surrounding roar—and then, finally, his wait was over too, raising both arms to the sky to join the rolling celebration. Tiger Woods is a winner again, five years and 50 days since the last time he claimed a tournament trophy, in August of 2013 at Akron. In the final event of a comeback season defined by teasing near-wins and the rising, anticipatory buzz that accompanied each of his promising rounds, Woods ground out a two-stroke win with a one-over Sunday, in the process providing the most emphatic, affirmative answer yet to the yearslong question of whether he was back. It was not a dominant close-out of the old Tiger vintage; he entered Sunday leading by three, and though his advantage ballooned as high as six strokes it shrank with consecutive bogeys in the round’s late stages. What Woods’s day lacked in the brilliant theater of his first three rounds it made up for in diligence and completion and a rising drumbeat of yes, it’s happening. It was that question, unimaginable when he was ripping through the field in majors a decade ago, that has imbued meaning into the 42-year-old Woods’s every action in recent years. His victories once piled dependably like spent calendar pages, the level and style of his success so singular it can best be described tautologically: He was Tiger Woods. Then came a widely chronicled 2009 tabloid scandal that shattered both his image and his marriage, combining with physical wear and tear to extend a 900-day drought between tournament victories. In 2012 and ‘13 he completed his first comeback, winning eight times in 17 months. Then the wheels came off. His body broke; his mind reeled; his opponents grew emboldened. In 2014 he underwent the first of an eventual four surgeries on his back. The muscular, indomitable robot of metronomic ruthlessness who had once lorded over his sport proved more mortal still. He changed swing coaches; one of his former tutors claimed Woods had the chipping yips. By the end of ‘15 Woods sounded defeated, saying publicly that he could not see the light at the end of the tunnel. Stories emerged that he had once considered quitting altogether to join the Navy SEALs. He got busted for DUI. He spent most of ‘16 and ‘17 convalescent as his fused spine recovered, starting just one tournament and failing to make it past Friday. No longer the tour’s teebox king, he re-tailored his game and tried out new drivers. Results were uneven. He arrived in Augusta as a favorite in some sportsbooks but finished tied for 32nd. He missed the cut at the U.S. Open, then followed with a pair of top-six finishes, including the Open Championship at Carnoustie, after which he told his children he hoped they were proud of him for trying. He surged late to place second at last month’s PGA Championship. He said his back never went an entire day without hurting. He returned to using the Scotty Cameron Newport 2 putter with which he won 13 of his 14 majors. He finished sixth in his first event with it, last weekend’s BMW Championship. He was back, or about to be. Woods arrived at Atlanta’s East Lake Golf Club this week itching to prove as much. It is a course for which he harbors both affection and respect, and he approached it conservatively. (Having not played the course since it switched its front and back nines two years ago, Woods also endearingly and repeatedly mixed up the holes’ numbers when recapping his rounds.) He blasted an opening-round 65 that set the sports world abuzz, prompting Arizona Cardinals wideout Larry Fitzgerald to pause an interview session to marvel at Woods’s eagle on 18. Over the following days, while shooting 68 on Friday and 65 again Saturday, Woods inspired tweets from Steph Curry and was followed for 18 holes by Vince Carter. The Golf Channel’s whimsical @GCTigerTracker Twitter account fawningly to its 326,000 followers, many of whom lined the ropes at East Lake asking passing reporters if they were the account’s author. Woods appeared to spend the tournament in a state of hopeful restraint, pumping the brakes at talk of victory after he held his first 36- and 54-hole leads in years while noting that a tournament win was among his season’s many goals and one of the few to have yet eluded him. Woods kept up the cool on the first tee, spinning his driver through his hands as he gazed at a fairway-bound 292-yarder. His goal had been to play under par and let the rest of the tournament play catch-up, and after birdieing the first hole he played conservatively, befitting his plan. His shirt blotting a darker crimson and his skin glistening in the heat, Woods played less evenly Sunday than his subsequent run of eight consecutive pars would suggest. A beautiful recovery from the bunker on 4 helped him save par with an 11-foot putt, and an iron slipping from his hand on the follow through of his approach two holes later did not stop it from landing within 26 feet of the hole. All told he left four putts within inches on the round, costing himself a few strokes, and he nearly left his tee shot on 15 short enough to splash in the water. It was a thrilling and novel experience, but on the green Woods found himself caught off guard by different emotions. His second shot had landed in a bunker, and he planned “a little chunk and run” to get onto the green and close out. Once he got from the bunker to the green in one shot, he knew it was over. Watching McIlroy—whose scattershot 74 had slipped him from contention—tap out his own final putts, Woods fought back tears. Two putts later, his feelings nearly spilling over, Woods had officially finished the 80th win of his career, one among its most meaningful. It was the parting answer of Woods’s press conference and gave it an appropriate end, at once showing the softened, introspective demeanor he has come to display and putting perspective on the length of his winding, turbulent career. Minutes earlier he said that he was happy to have been playing and competing again. “Win, that’s another level,” Woods said. “But I’m just enjoying being able to do this again.” The masses at his back are too.